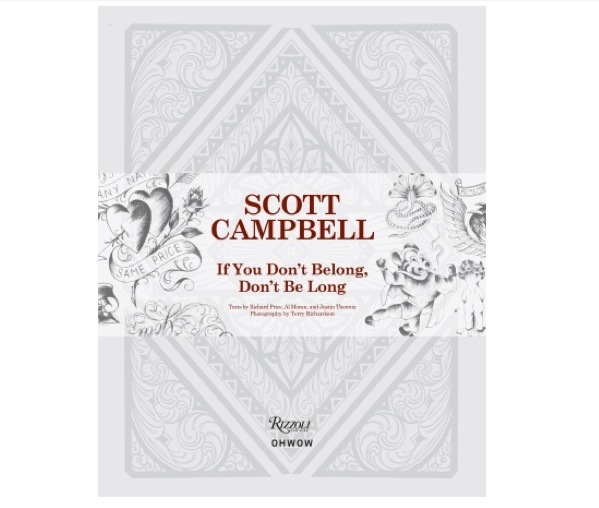 Coming next spring from Rizzoli, and produced in conjunction with OHWOW publishing, comes Scott Campbell’s first monograph focusing on the duality of his artistic career both as a tattoo prodigy and a fine art powerplayer. Named in homage of his debut New York solo exhibition last year, If You Don’t Belong, Don’t Be Long discusses how his ink work informs his gallery work and vice versus. Referencing of “new antiquarian” style, nineteenth-century hand-lettering, kitsch, and classic tattoo “flash”, his art – as seen this year with a huge LA solo and a three person NYC exhibition alongside icons Raymond Pettibon and Steve Parrino – is as timeless as it is dramatic. To accompany hardcover publication is an telling selection of text from Al Moran, the co-founder of OHWOW, Justin Theroux, actor, screenwriter, and director, and Richard Price, an American novelist and screenwriter. Set to drop in February of next year, this will be a nice addition to the bookshelf for those interested in the parallels between two different yet complimentary forms of art. Categories: Art products, Contemporary Art, Publications, Releases. Tags: Al Moran, Art products, Contemporary Art, Justin Theroux, OHWOW, Publications, Releases, Richard Price, Rizzoli, Scott Campbell.